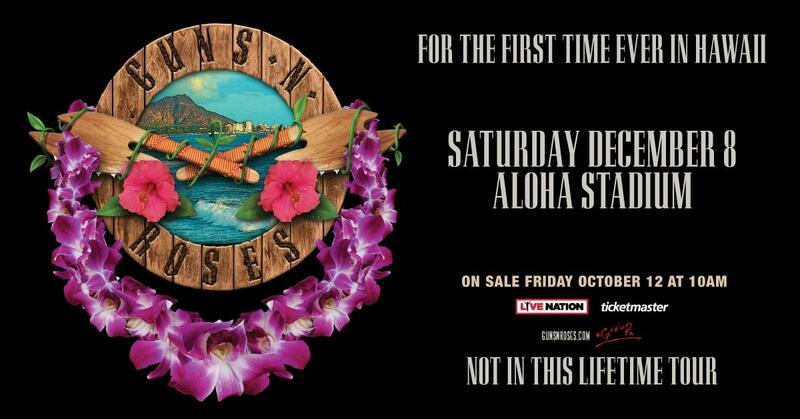 Los Angeles, CA (October 5, 2018) – Guns N’ Roses and their outrageously successful Not In This Lifetime Tour have dominated the globe and are continuing the incredible whirlwind by announcing their first show ever in the state of Hawaii. The Southern California rock band will bring one of the most ambitious tours in rock & roll to the paradise city of Honolulu, playing for thousands of fans at Aloha Stadium on Saturday, December 8th. The historic show will be a can’t miss event for fans all across the Hawaiian islands and the entire west coast of the USA. Tickets are on sale to the general public starting Friday, October 12th at 10:00am HST at Ticketmaster.com and at the Aloha Stadium box office. Thursday, October 11th at 9:00pm HST through Citi’s Private Pass program. For complete presale details visit www.citiprivatepass.com.